Well, these particles are stored in the .spa files. This is 2-2, which contains the gravity control blocks. Wow! You've got a good idea with that behavior! But I would like to suggest something, It would be better if you made 'em with arrow textures instead of plain, like in SMG. Do you remember? If you do, yes, I'll trying to improve the texture. If you could it would be great. Maybe from some good quality screenshots. I now am working on my ruins tileset, the nmt file isn't finish, but I'd like to post the image first, to make you know that I'm still in progress. D..Do you get it from anywhere? It's very attractive and very lovely - looks neat and perfect! The only thing I see that's not good is that your third and fourth palette need more adjustment. It's looks too bright in some colors. Your second palette is good enough already, but if you can, it's also pretty cool to darken the symbols lines a bit. It should be "I am now working" rather than "I now am working". Thanks a lot! I took a long time to draw it. Hmm... The only one thing I get from Internet is those symbol, they all actually mean something, like "death", "cloth" and some other words. Most of them are Egyptian symbols and Hebrew. Ok, I think it'd be easy to modify these things. Oops, I must be very tired then. I'm not very sure of how much effect should I take. I love your third palette! But the second one could be a little bit darker, like the fourth, with that bright borders. But I haven't done any tileset. You can forgive this, if you want. The second palette in the new version looks nice over the previous one. Your new revision is nice. You may take gridatttack's advice into an account - glowing. BTW It looks great after all. I love wallowing in old threads and posts to see what the luck give to me. The NSMB 6, designed by Unknown Object is an unknown found. The game is a mini-hack with 1-world designed. But the player must download this game. There is a lot interesting ideas to explore here. The hack has some little problems, but nothing that the user can pass through. 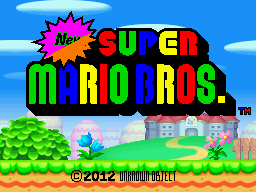 The title screen is very good colorfull, but have a little glitch on the "New" logo. 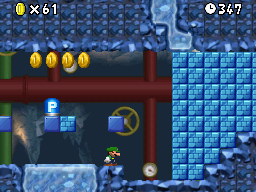 The first level have a good design, but the user could lost about to do with the Letter Boxes spread on the level, just to catch a Star Coin. Ubknown Journey: unknown "new" logo bug, and unknown what-to-do Letter Boxes. I had the honor to play "Unknown Jorney" and among the various hacks that I played, I would like to place on record my humble opinion. "Unknown Jorney" don't have my highest degree in my concept of elegance but have unique originality on level design on the variants of the New Super Mario Bros game. The player can see the good level of art after finish the first level and take to second level. 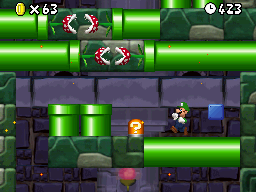 The tilesets help the level to show up, but the strategic location of the pipes was very well designed. If the player complete the second level in normal path, will have some surprises on the level 1-3. 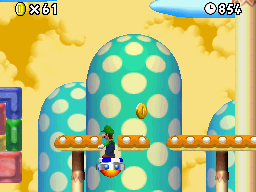 When the player perform a ground pound over some scenarios like mushroom tiles, the floor below simple blow-up. The classic underground second level. And broken tiles to access the catapult. I not played all levels available because I just wanted to try the game. Because that, in this review you can see just the levels that I passed. 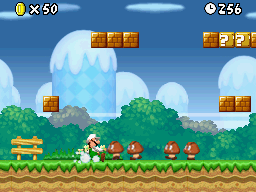 For example, the level 1-4 working on SMB-1 1-1 design. It's not a bad thing, after all I loved the 1-1. Especially when you have a new design and different passages to explore. But I didn't see too much diferences. The level 1-T explore the more pure design concept. I explain: the level have a very good use of tilesets in hand. The location of pipe, walls and position of elements. The author must had a litte work to make it. And have a good ideas too. More of the same in 1-4. The same, but the more, in 1-T.
Of course nobody really played this game before me, because if yes, player can see that level 1-5 is impossible to start without a Red Flying Block. And if the player used all Red Flying Blocks before reach the level 1-5 will notice that cannot reach the 1-Castle level. 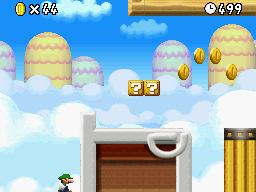 The reason is simple: The entrance of this level is a "Jump". But the jump is not to long in length for the player reach the border of the ship. The images show two times. The first, with a Red Flying Block. The second image is without the brick. Notice the player just fall to abyss. How said skawo's onomatopoeia: "Tut, tut...."
The level 1-5 and "tut-tut" Red Map Flying Block. With block, and without block. 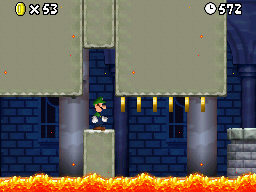 The last playable level of this hacks is the castle. 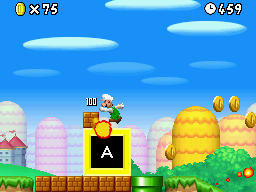 Player will find much of stone blocks, lowering and rising from lava and from the ceilling. And interesting use of micro-mushroom and bullet bills. 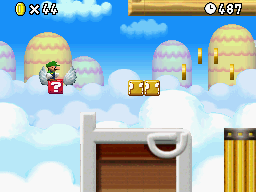 After this the Bowser's room is the same and the player can reach the second world. The hack stop on World 2, and doesn't have any implementation of the last videos of Unkown Object. Level 1-Castle: The last playable level. If the player complete the fist world, will notice there is no new implementation of the World 2. It means the player will not have access to Level 2-1 with para-koopas; Level 2-2 with gravity blocks idea; and Level 2-3 with new swamp tileset design. It's a sad side, because I really would like to see these levels. I don't know why not the second world wasn't lauched. But, maybe a good time to see this in action. There's nothing I can say more about this hack, but just wait the work finish, but I don't think that will be a finish. But Unkown Object have my sincere congratulations, to spread his fantastic perspective of the "Unknown Journey". ...why did you bump this 4 year old thread of a user who hasn't viewed the board in 1247 days? It's time we take a stand. If you at least read the review, you know why. But Pinet make a mistake when said that "nobody really played this game before me". I played. And I almost put in my compilation (see thread link in my profile), but there was too many adaptations to do, for fit the levels on the original tilesers. And I just give up. I would like to see the gravity blocks in action too. I don't know if it uses ASM or some event sprites.